Microsoft's CEO Satya Nadella is on a mission to make all the company's products and services accessible to everyone. If it seems like Microsoft's accessibility efforts are getting almost as much attention as its cloud, Windows and productivity businesses, you're not mistaken. Since becoming the company's CEO, Satya Nadella has made "inclusive design" a core part of the company's business model. It is almost impossible to see a major Microsoft event or hear a significant Microsoft announcement without hearing how accessibility is woven in. Nadella acknowledged that historically companies, including Microsoft, would build products and address an accessibility "checklist" after the fact. This post-design focus on assistive technologies was limiting because it resulted in narrowly designing products for able-bodied people while excluding millions of others with disabilities. With inclusive design, accessibility is an important part of the design phase. People of all abilities are considered while the product is still a concept. This results in purposeful engineering of products that are broadly designed to be accessible to everyone. Nadella stressed that accessibility is a result of inclusive design and that it enables the over one billion people with disabilities to participate in modern society. I recently predicted that 2019 would be the year inclusive design would become mainstream. Nadella echoed that analysis in a recent interview. From gaming to helping the immobile navigate Windows and helping the blind navigate the world, Microsoft's inclusive design mission is bold and comprehensive. This aggressive accessibility mission is intertwined with an equally aggressive AI agenda. AI is a major and necessary part of Microsoft's inclusive design efforts. Machine learning, natural language processing and a host of AI-powered cognitive services that emulate human senses and abilities help Microsoft's products and services bridge the gap between the limits of an individual's ability and their access to modern technology. Microsoft's iOS app Seeing AI "perceives" the world, recognizes facial expressions, physical activities, reads documents and more for people with visual limitations. This app was designed by Saquib Shaikh, a Microsoft Software Engineer who is also blind. Microsoft's inclusive hiring practices allowed the company to benefit not only from Shaikh's programming talent but also his perspective as an individual with blindness. Hiring people of varying levels of abilities is Microsoft's intentional strategy to ensure broad perspectives are brought to the design process so that its products and services are as inclusive as possible. Eye Gaze, the result of a Microsoft hackathon contest, is built into Windows 10, and it allows people with immobility to navigate Windows with their eyes. Football great Steve Gleason, who is living with quadriplegia, uses this technology to operate his PC with his eyes. Microsoft's Xbox Adaptive Controller made waves last year as it opened the world of gaming to millions of people who are unable to manipulate traditional game controllers. Nadella stressed how inclusive design even extended to the controller's packaging. The box is designed to be easily opened by people with a range of motor limitations. Microsoft's Project Fizzyo turned Cystic Fibrosis treatment into an engaging game to encourage children to endure unpleasant procedures. Project Torino teaches blind children to code. Immersive Reader helps people with Dyslexia read. The Emma Watch stops the debilitating hand tremors endured by people with Parkinson's disease. And Microsoft's Autism Hiring Program tailors the interview process to avoid excluding people with autism from being hired. Microsoft's broad focus on people with varying levels of abilities reflects a value that is at the company's core: empathy. Nadella has been deliberate in establishing this value, which helps people look at the world through another's eyes, throughout the company. 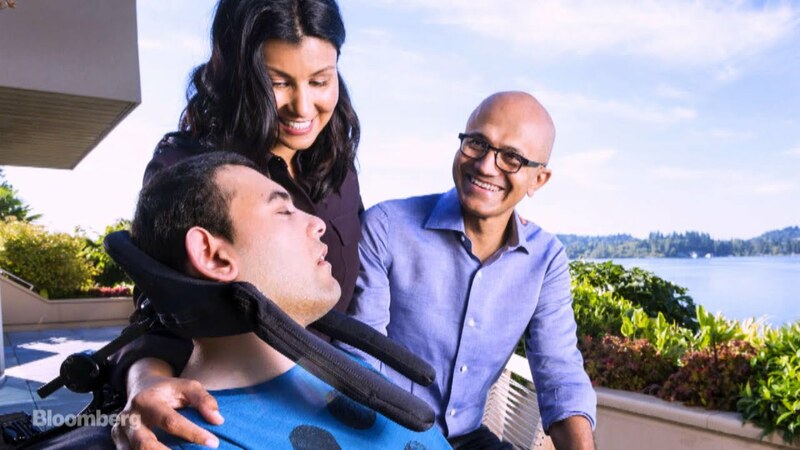 Nadella says he learned this value after feeling something "happened to him" when his son was born with severe Cerebral Palsy and he began looking at the world through the eyes of his son. Google and other companies are aggressively pushing inclusive design within their software and hardware products, as well. Google's goal, according to its User Experience Lead Jen Devins, is to allow everyone to contribute without barriers. As the world of tech moves beyond a post-design accessibility checklist model to creating products from conception to be accessible to all, inclusive design is becoming mainstream. The language is established, the concept is becoming more broadly understood, and most importantly the inclusive design efforts are beneficially impacting hundreds of millions of people. With the foundation having been laid, 2019 looks to be the year inclusive design goes mainstream. And though Microsoft is not alone in its implementation, it is unique. The very human story of a CEO who learned empathy through a son with a severe disability and who is now teaching that empathy to a company makes Microsoft's efforts seem more real. Nadella's openness about his family life, experiences raising his son and views about failure as a teacher seem to have inspired Microsoft's employees to think and act outside the box. This push beyond traditional boundaries has pushed the company to the forefront of the inclusive design movement.